Minimap is a plugin for Ashita v3 that displays an in-game map on your screen at all times, when available. Minimap is similar to tools like ApRadar, FantasyWarp, etc. but built into the game via an Ashita plugin. 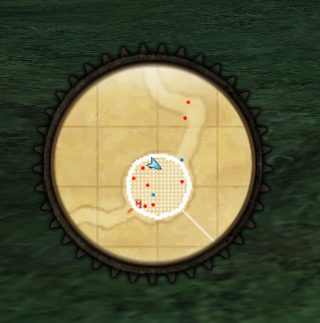 Minimap works by making use of in-game functions and map data from the game client. No more map.ini to maintain guessed map information with sketchy updates and broken zones. Minimap instead pulls the map bounds and scaling information directly from the game client. Map information is handled 100% via the client so there is no room for error! 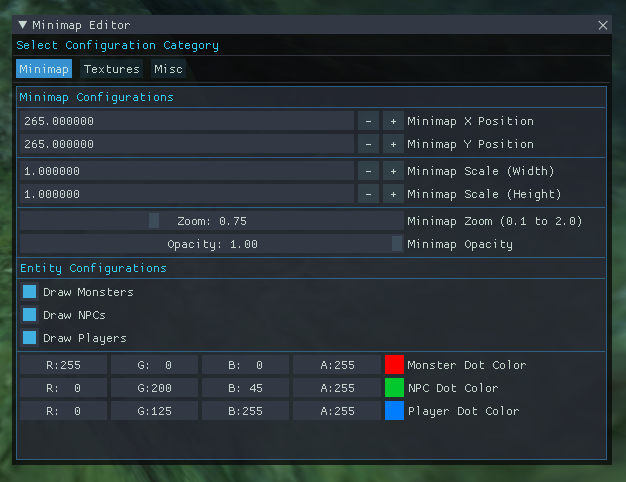 At this time, Minimap depends on a map pack, similar to the ones used by ApRadr, FantasyWarp, and similar tools. Not for the map.ini, but simply for the map image files. In a later release, Minimap will have the option to load and read the maps directly from the dat files. (Due to how many different image formats SE uses for the various maps, this is a setback for now.) This is also a feature of Minimap to allow custom overrides of maps as it will use .gif images as priority then fall back to using DATs when no gif is found. Re: Minimap - In-game minimap! Minimap X/Y Position - Sets the position of the minimap on-screen. Minimap Scale (Width) - The overall scale of the minimap (width). Minimap Scale (Height) - The overall scale of the minimap (height). Minimap Opacity - The transparency of the minimap image. Draw Monsters/NPCs/Players - Toggles the drawing of entities on the minimap. 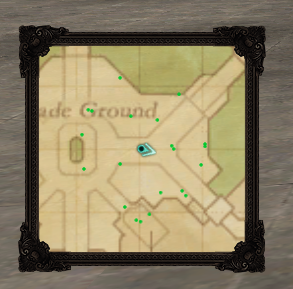 Monster/NPC/Player Dot Color - Sets the color of the given dot type that is drawn onto the map. Currently just contains a few buttons to handle some basic tasks. Will add a picture / more info later if more options are added to this pane. 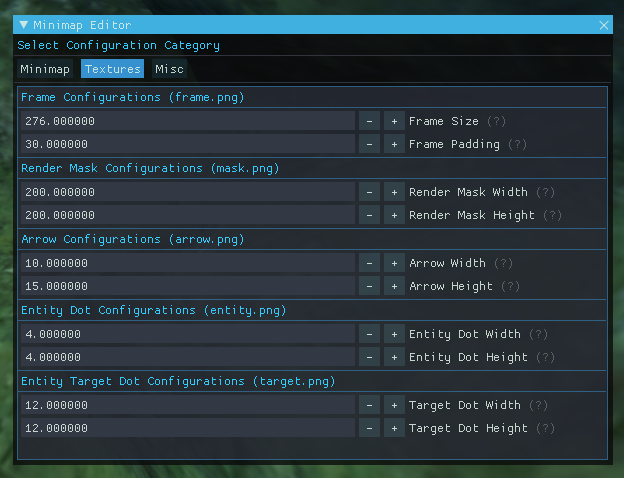 This file contains all the configurations you can edit via the configuration editor. This allows you to share your settings with others, for example, if you have altered the images used by Minimap and wish to share your customizations. You should make use of the in-game editor to edit things rather then editing the file directly. However, if you would rather edit the file directly, you can use the Misc tab to load/save the configurations on the fly. Minimap features the ability to be highly customizable. You can edit (nearly) everything about it. frame.png - The main frame image that is displayed around the minimap. mask.png - The main mask image used to determine the area that the minimap will render within. arrow.png - The directional arrow used to display the players heading direction. entity.png - The dot used to display an entity on the map. target.png - The dot used to display a targeted entity. maps.json - The map information containing the dat id and map gif that related to a given in-game floor entry. 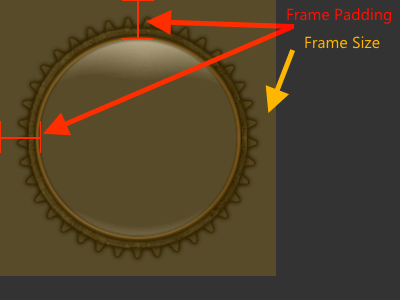 Here is a quick rundown image of things to understand about the frame image. The frame size is the overall size of the frame image. The width and height should be the same. For example, the included frame.png is 276x276. Thus, the frame size is 276. The frame padding is the distance between the edge of the photo and the render mask area where the map will be drawn. This should be determined by the closest points to the frames image edge. (ie. pixel 0x0) In the example image above, our frame sits offset of the edge by 40px at its closest points to the rendering area. So we use 40.0f as the value for the frame padding. The mask is used to determine the area where the minimap will draw within. Any area within the map that is non-transparent will be considered valid for rendering. 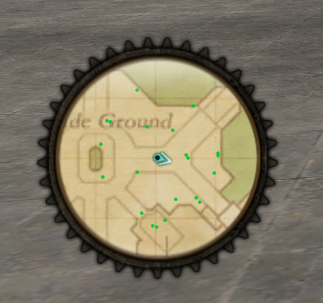 By default, Minimap ships with a circle sharp rendering area. However, you can edit this area to be a square, a triangle, or if you want to get creative, a Pikachu! The rendering mask sizes that are used in the configuration file are determined by the overall image size of the mask.png. 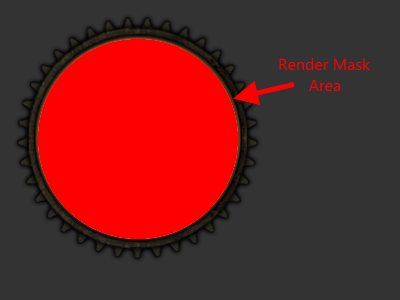 For the best results, your mask.png should fill the area within the minimap frame that is transparent. Check the included frame.png and mask.png to better understand this concept. The entire circle area that is transparent within frame.png is filled in by our mask.png, which is 200x200 in size. Note 1: By default Minimap will look for the map files within <Ashita Path>\plugins\minimap\maps\ as its primary source for a map file. This allows you to override the map that is displayed in case you wish to make any custom edits to the map to be displayed on screen. If the gif is not found, Minimap will now resort to loading the maps DAT file instead. Add: Minimap now includes two modes; circle and square. Change: Updated the textures that are used by Minimap. Add: New textures are included for square mode. Change: Altered the in-game configuration editor to be slim and compact. Change: Changed in-game configuration editor to not open by default when the plugin is loaded. Change: Configurations are now stored inside of minimap.ini instead of minimap.xml. Change: Cleaned up and optimized the DAT loading code. Please note, some of the changes done in this update will not take effect unless you delete some old files! Updates to the main posts will come soon to match the newest version of Minimap and its features.